High atop a New York City rooftop, Raph is worried. His backpack contains some sensitive material he has to get back to his brothers before it’s “too late”. As he races across the roofs, he suddenly finds himself being pursued by a squad of Foot Soldiers. Raph has more important things on his mind, and though he’s loathe to do it, he decides to escape the Foot rather than fight them. Unfortunately, the Foot simply won’t be shaken and proceed to catch up to him. Annoyed, Raph dispatches with them (bloodlessly) in record time and returns to his mission (but not before laughing and mocking the pile of groaning, defeated ninja). 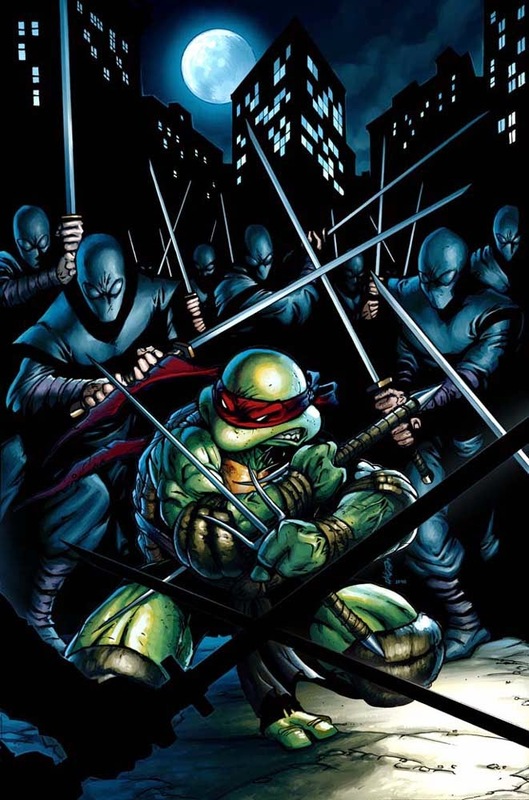 Raph returns to the sewer and makes his way to the lair, where two of his brothers have been waiting for him. They applaud him for making it home just in time. Raph removes the sensitive material from his backpack: Rose Garden Chinese Take-Out. Had Raph arrived a minute later, he’d have lost the bet and been forced to pay for dinner. *This issue also contained unrelated stories titled “Fist of Justice: I Think, Therefore…” and “Mask of the Gargoyle: The Fire Devil”. *This issue came with three variant covers, one focusing on each story. *So far as the Turtles’ timeline is concerned, this story best fits shortly after TMNT (Vol. 1) #21, in which they kill the Shredder and incite retribution from the (disorganized and easily defeated) Foot Clan. *To date, this story has yet to be reprinted. 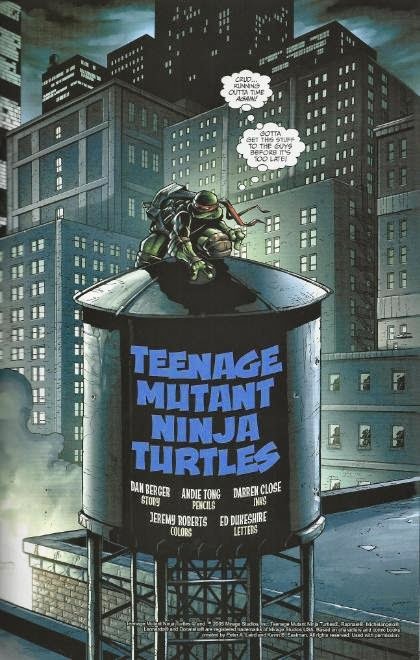 Special thanks to TMNT fan "Tokka" for the image of the Ninja Turtles variant cover. I own the “Fist of Justice” version of the issue, which was apparently the most common, while the TMNT cover is the hardest to come by. With that out of the way, it’s on to the story itself. This short little piece fits in well with all the other back-ups and guest strips the TMNT have been in over the past few decades, many more notable than others. On its own, it certainly doesn’t sound very exciting, but the “Digital Webbing” short is one of those comics that stands out thanks entirely to its artwork. Andie Tong’s pencils are excellent, hitting all manner of dynamic angles, poses and a spine-crunching sense of kung fu action. 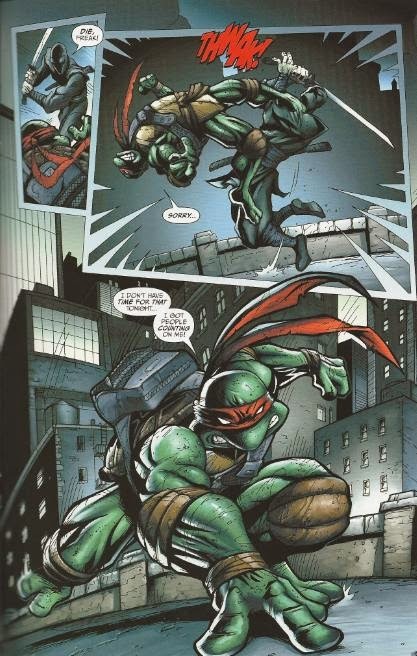 The comic is only eight pages long, consisting primarily of action sequences as Raph knocks out each Foot Soldier one at a time, but you’ll savor each panel. I can’t say I’ve seen much of Tong’s other work, though he’s penciled issues of “The Batman Strikes!” and the “Masters of the Universe” comic, if Wikipedia is to be believed. I’d certainly like to see him work with the Turtles some more. Helping Tong’s pencils along are some moody inks by Darren Close, but perhaps most of all, some excellent digital coloring by Jeremy Roberts. The effect results in a look and feel similar to the Dreamwave TMNT comic made to tie-in with the 2003 animated series, but without Lesean Thomas’s poorly proportioned Turtles and hideously “stylized” humans to ruin things. Roberts’s colors make for a more modern sort of “dark and gritty”, but “dark and gritty” all the same. So far as Berger’s story goes, I can’t say whether it was intentional or not, but it actually works perfectly in that gap between “Return to New York” and “City at War”. After the Shredder’s death, we learn in “City at War” that the Foot Clan became a disorganized mess, and though they swore vengeance upon the Turtles for their Master’s demise, they were too sloppy and pathetic to carry their mission out. 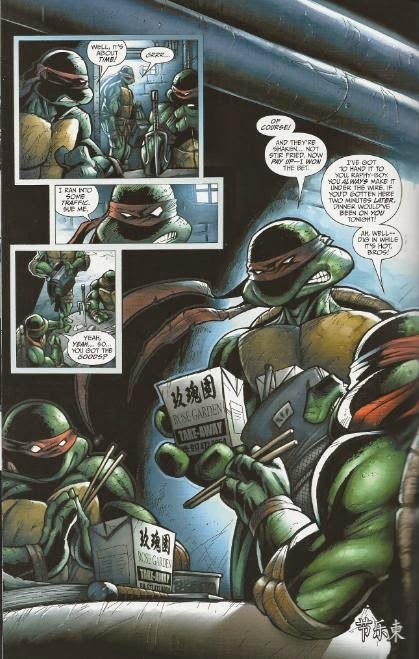 Stories like this and “Kung Fu Theater” from Tales of the TMNT (Vol. 2) #25 are excellent examples of that fact, as the Turtles defeat the past-their-prime Foot Ninja with humorous ease. So, overall? It’s the usual Ninja Turtles back-up strip. There’re a million of them out there, but I’d say that this is definitely one of the better ones. It’s short and breezy, but the fresh pencils of Andie Tong and the digital coloring of Jeremy Roberts help it to stand out. Its use of the Foot Ninja might also make it worth your while to track down, if you’re really into them. one of my fave short stories !! ! !